AS SHOWN 2018 Heal's Discovers finalist John Eadon with the Trellis Shelving unit. Spread the cost from only £119.38 a month with Interest Free Credit. Our Heal’s Discovers programme was launched in 2004 to take concept designs through to collectable pieces design lovers will cherish. Trellis by John Eadon is an open and light freestanding modular shelving system with arched tops, ladder sides and interchangeable panels and shelves. This freestanding, adaptable modular design, that can also be used as a room divider has an arched top and bottom making it a truly standout piece. This simple design is produced from sustainably sourced British ash which was chosen for its excellent strength, flexibility and warmth. The interchangeable panels can slide into place between the side spindles or back panels, without the need for fixings, before placing the shelves on any level. The creative freedom that this shelving unit offers is unique as it allows for multiple personal configurations, ideal for creating your own look within a space. Flexible configuration - the panels and three different shelf sizes can be rearranged to the user’s desire creating endless possibilities and uses. The Trellis unit features interchangeable panels and shelves providing flexible storage. A truly adaptable modular shelving unit that can be extended and modified easily without the need for fixings. For more info and sales on these extending pieces call us on 0333 212 1915 choosing Option 1. Material: Ash frame and shelves. 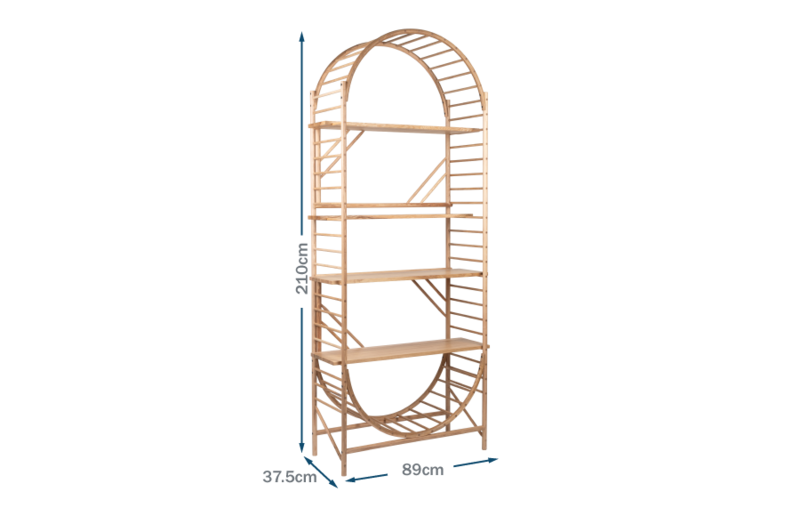 Includes: 3 x full depth shelves, 1 x half depth shelf, 2 x panels with spindles, 1 x overall frame.